My eyes have not seen the rest of the world — Texas is all I have ever known. I used to fear that I had lost my roots and my identity. Recently, I’ve found rediscovered them, at home in the Lone Star state. I have been accepted and am attending the University of North Texas at Dallas, and I plan to study Business and Spanish. I will be the first in my family to attend college, and I aim to be the first college graduate as well. I have set goals that I am determined to accomplish. Since the age of 6, I have lived in fear of deportation. All I have ever wanted was for this constant sense of fear to go away, and now, with DACA, I finally feel safe. In a perfect world, a law would be created that allows DACA students a pathway to citizenship. I have always thought that at the age of 18, any DACA qualified youth who has graduated from high school in good academic standing should be allowed to apply and obtain permanent citizenship in the United States. I have two younger sisters who are American citizens. I am extremely grateful that they were born here, so they don’t have to face the same fears and obstacles associated with being undocumented. 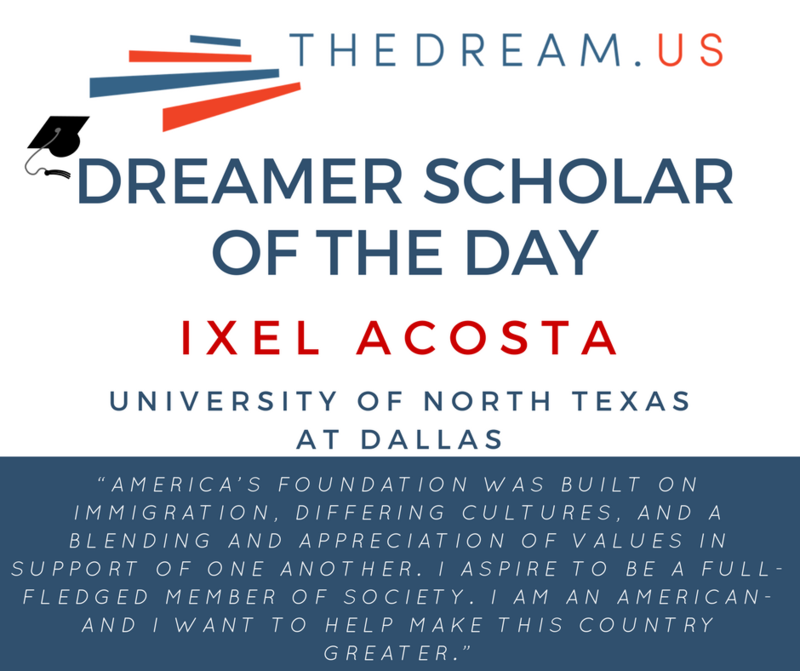 For most DREAMers, like me, the only country we have ever known is the United States. We have grown up “in the land of the free” and seek to pursue the American dream. We contribute to this country through our education and our taxes. America, this great country, has opened its doors for years to welcome those who been seeking better life opportunities. America’s foundation was built on immigration, differing cultures, and a blending and appreciation of values in support of one another. I aspire to be a full-fledged member of society, contributing positively to this great country while receiving the same benefits as any other American. I am an American- and I want to help make this country greater.